Welcome to Crystal Shores West! This 2 bedroom 2 bath condo is located directly on the Gulf of Mexico on the west beach in Gulf Shores, Alabama. This unit will comfortably sleep up to 6 guests as it includes a queen sleeper sofa in the living room. The living room and each bedroom is equipped with a flat screen TV and Blu-ray/DVD player so you can enjoy having cozy movie nights in. This unit also has a large private balcony overlooking the beautiful sugar white sandy beaches where you can sit and enjoy the views with a nice ocean breeze. Watch the sunrise over the Gulf while enjoying your morning coffee or relax as you watch the gorgeous warm sunsets in the evening. Both the open concept living area and master bedroom have direct ocean views and access to the balcony through sliding doors. The large kitchen is fully stocked with seating for 4 at the breakfast bar and an additional 4 at the dining table. The unit also includes a full sized washer & dryer for your convenience. Crystal Shores West offers a great number of amenities including a game room with pool and foosball tables, a fitness room overlooking the beach, heated indoor/outdoor pools, a hot tub, sauna, BBQ grills for cooking out, and more. This condo is centrally located and just minutes away from The Hangout, amusement parks, the zoo, putt putt golf, grocery stores, golf courses, shopping, restaurants and movie theaters! 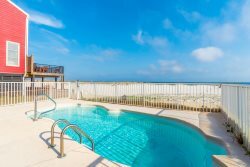 Come enjoy the beautiful views and the best that Gulf Shores has to offer at our coastal dream, Crystal Shores West #1006. NOTE: PARKING PERMITS MUST BE DISPLAYED AT ALL TIMES. ARMBANDS ARE REQUIRED FOR AMENITIES. BOTH PARKING PASSES AND ARMBANDS WILL BE PROVIDED IN THE UNIT UPON YOUR ARRIVAL. Keith's place was perfect for a quick weekend getaway. Love the lagoon view and it's right across from the beach (very short walk). Close to everything in Gulf Shores. The team was great! We had such a wonderful time we reached out to Keith to stay an extra night and he handled it without a hitch! Thanks Keith!! This place is AWESOME! Super clean, super comfy, perfect spot with gorgeous balcony views! We had plenty of dishes and pots and pans to cook for a night in! There was plenty of space for all of us to eat and relax! The beds and linens were comfortable and clean! The icing on the cake was opening the closest door to find a HUGE stash of beach toys, chairs, umbrellas, you name it! We have already decided well be booking again for next year!! Keith above any expectations that I had especially when I bombarded him with questions and even had to contact him on Thanksgiving day . We had the most spectacular time at crystal shores west 1006! The condo was absolutely exquisite, from the nice furnishings, the soft thick towels to the most important piece the bed, omg it was amazing, the linens were soft high quality thread count and pillow galore! Love Love Love this place and highly recommend it for a quick getaway or a family affair with the most breathtaking ocean views you will ever see! Thank you Flip Flop Vacations for an extraordinary visit! This condo was everything we were looking for when we booked our trip to the beach. It was clean and had everything we needed to enjoy our stay. It exceeded our expectations and we will be back! Thanks flip flop! This place was a perfect getaway! Very clean and a beautiful view! No Complaints here!! Condo was very comfortable, clean, neat and very well equipped. The kids really enjoyed the pool and the game room and especially having quick access to the beach. The view from our balcony was awesome!!. Great shops and restaurants within walking distance. Definitely, hope to do it again. The condo is everything you could want it to be. Walking in you can see and feel the clean, neatness and spaciousness. The views from both balconies and the front door are priceless. The pictures online do not do it justice. We enjoyed our stay so much and really hated to leave. We definitely will be back. Coastal Dream really lives up to its name! Enjoyed the stay very much. Loved the sound of the waves and that they could be heard even in our room. Pool and hot tub were great additions and helped us relax even more. Can't wait to come back and stay in the future. Keith was prompt when had to call about a question. He was great to work with. We absolutely loved the Crystal Shores West! The complex was very neat and clean. The beach and pool were so easy and assessable. We will definitely stay here again! THE place to stay if you're in Gulf Shores My family and I stayed here several days this summer. It's truly a comfortable beach condo where you can really relax. It's convenient to whatever you want to do in Gulf Shores. The view from the balcony is the BEST on the Gulf, no doubt about it. Access to the beach is super-easy via the private boardwalk. THE place to stay if you're in Gulf Shores! Everything was as expected...the only thing that was a real annoyance was the hot water didn't last long when showering!